A key aspect here is to ensure that transport systems are generating rich data in real-time as a side-effect of their use I.e. not as a discrete activity, measuring performance occasionally, but that systems are in effect working as continuous broadcast networks, each node - tram, bus, bike, car - generating data about its behaviour (effectively they become large ‘spimes’, or aggregates of spimes). Having achieved that, we can measure behaviour and thus measure change. And then feed back information to users to enable them to measure their own change too. The first users of the data should be the transport networks, the public or private bodies that run or legislate them, and the public themselves. This last feedback loop becomes the most interesting, ultimately, as it not only makes the transport systems accountable for their performance, but also enables users to perceive, measure and change their own behaviour. Each car, bus, tram becomes a node in an informational network, not just the transport network - and visible by the public. Moreover, by opening up this information, people can tinker with their own applications to monitor, explain, explore transport usage - the kind of open approach to data that has fuelled the rapid growth of internet-based systems. (Related: The Personal Well-Tempered Environment) People can engage further with the city, seeing it through the prism of transport, building stronger civic relationships. Inrix: data provider from stationary sources, toll systems, 650,000 vehicle probes. They then clean and sort the data and sell to TomTom, Garmin, dash. Navteq - Traffic.com: road sensor network (the biggest in the USA). TomTom Mobility Solutions: cellphone vehicle tracking project (with Vodafone). 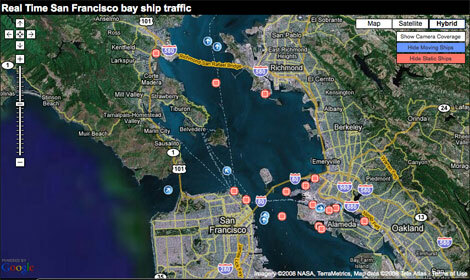 All of these rely on massive amounts of real-time data, then filtered and aggregated. The data used by most city and state governments, however, is often years old (Boston uses data from 1991, which is hopefully a worst case). Zegras suggests that most transport systems have not yet made started capturing this rich data, nor made coherent use of the data they do have. Public-private partnerships would be a good model, given the pace of the private sector’s innovation in this field, but the need for strategic overview and public responsibility lies with the state. Thus it is vital that governments retail full exposure to, and control of, the data. Below, some example projects grouped into 10 categories, starting with an overview over transport systems, and then initiatives in specific modes of transport, from cars to walking via taxis, flight and more besides. 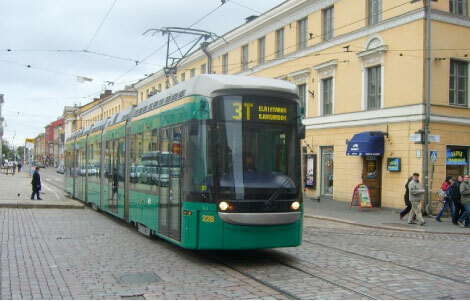 Perhaps the best case study comes from the best public transport system in Europe - as ranked by the European Commission - the Helsinki system, with nine out of ten residents satisfied or extremely satisfied. This is due to many aspects of their service, but a particular advance can be seen in their use of information - within buses and trams, but also at the level of the network itself. These are all techniques to reduce time at the bus/tram stop and progressively increase time on the bus/tram versus other modes of transport. This is an informational overlay onto public transport that would help shift behaviour away from private transport. This indicates the base-level aspirations emerging around public transport now, over and above on-time, comfortable and affordable. 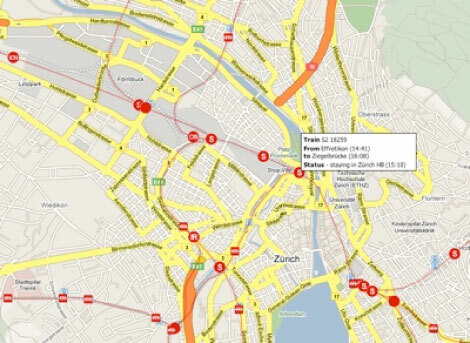 Note that the following map-based system - click to see buses and trams moving in real-time throughout Helsinki - is open. This is an example of this new civic engagement in public transport. Of course, if subsequent user-generated systems or displays become successful and well-implemented, they can be ‘adopted’ by the city, and made secure, resilient and reliable. It’s a common approach to innovation in the technology world. Transport energy can clearly be displayed using the same techniques I.e. overlaid on these Google Maps-based real-time timetables. And this published to the mobile and personal platforms mentioned above, as well as on displays on bus- and tram-stops, creating an association between saving transport energy and public transport. Not even Helsinki is doing this yet, as far as I know. Combining real-time data about the various modes of transport would enable this holistic overview of the city’s transport to be published, shared and discussed, leading to far greater engagement from the public. This, in turn, leading to potential behavioural change, particularly if conveyed with imagination, as a series of attainable goals against which progress can be judged on a daily basis. 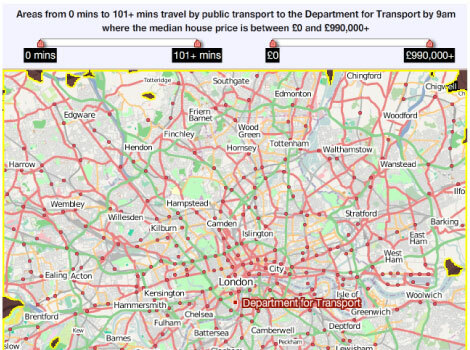 It could sit alongside reward/congestion schemes. 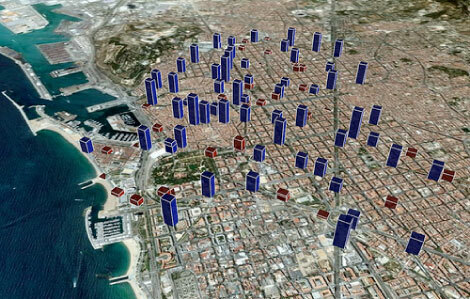 Publishing the data in an open format, ideally via an API, would enable it to be usable on Google Transit. Perth has recently joined Google Transit, as the first representative of Australian cities. Interestingly from a transport planning perspective, the engineer integrating Perth’s transit data with Google noted the distinct advantage that Perth has in running the only fully integrated public transport system in Australia (in terms of ticketing, journey planning and timetable data). We often hear rather breathless descriptions of how the Octopus integrated ticketing schemes has extended into many areas of retail. But these aren’t just about ease-of-use and customer loyalty, any more than FlyBy and Tesco Clubcard are. They are far more powerful in terms of data generators, exposing patterns of use in transport networks, and even influencing patterns of use in transit - again, just as Clubcard has given Tesco unprecedented levels of information on consumer habits. As with London’s Oyster, such schemes would convey vast amounts of useful data on patterns of behaviour - suitably anonymised and with privacy taken into account of course. 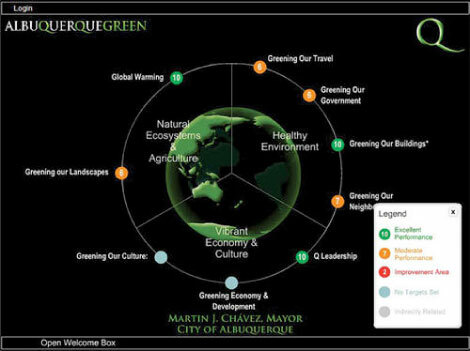 In Albuquerque, New Mexico, the city commissioned Vancouver-based company Visible Strategies to use its See-It program (short for Social, Environmental, Economic-Integration Toolkits) to convey how the city was progressing in terms of sustainability strategies. This, on the premise that few citizens will actually read paper-based strategies in detail. 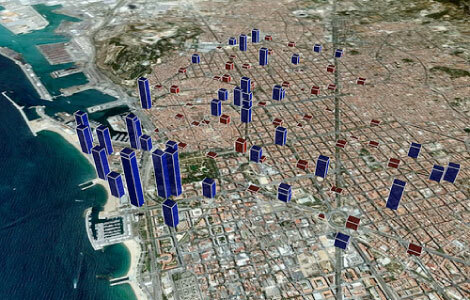 It relies on data from the city itself, and indicates a richer way of publishing strategy and conveying information. With a bit of imagination, this could be extended by opening up aspects of the data to enable others to re-combine it, and by embedding the displays in bus- and tram-stops etc. 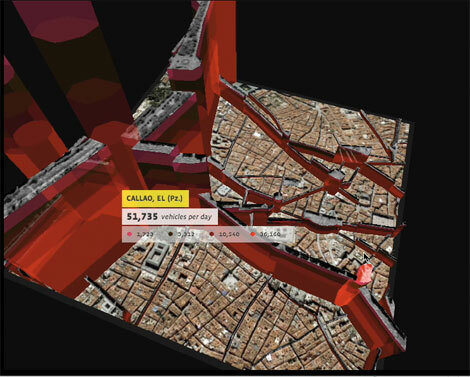 These beautiful visualisations - called Cascade on Wheels - indicate two ways of modelling volume of traffic through Madrid’s centre. It’s based on a static data-set, but indicates an interactive system for exploring the pattern of behaviour over the terrain, in an almost tactile fashion. 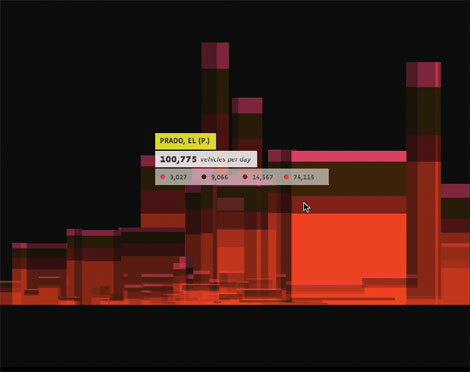 While the information itself could also be communicated in an Excel spreadsheet, and usually would have been for years, these new ways of visualising and handling the data do appear to add a deeper level of engagement - almost visceral - with the material. One of the outputs is a sound-based interface, which is an interesting and under-used variant on exploring such data. Car-rental models could be usefully stimulated in order to reduce reliance on private cars (in a sense, just as bike-sharing schemes have). Both ZipCar and Flexicar in the US have struggled to turn a profit, despite some popularity, and ultimately merging (with not great consequences, allegedly). However, in part this is due to the established players of Hertz and Enterprise picking up on the business model. (See also Smartdrivers and GoGet in Australia; Whizzgo and CityCarClub in the UK etc. Note that Whizzgo cars are exempt from the London congestion charge, hinting at the integration with these wider strategies.) 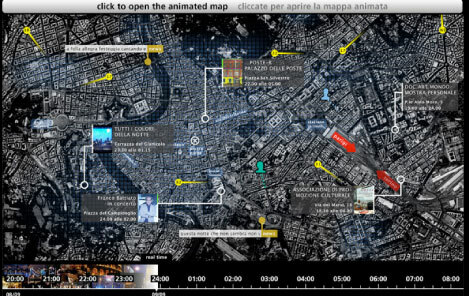 These systems tend to increasingly rely on Google Maps and access/identification systems, and could publish data about usage, enabling it to be folded into the holistic model described above. The founder of the US’s most successful car-sharing network gave a talk last year about seeing transport systems as ‘mesh networks’, connecting in real-time in order to optimise service. 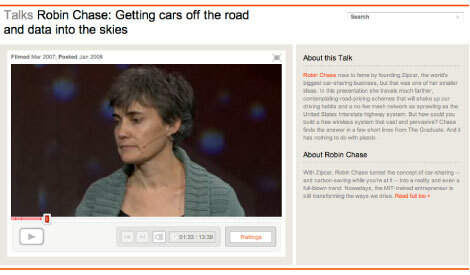 “Robin Chase: Getting cars off the road and data into the skies". See also StreetsBlog. 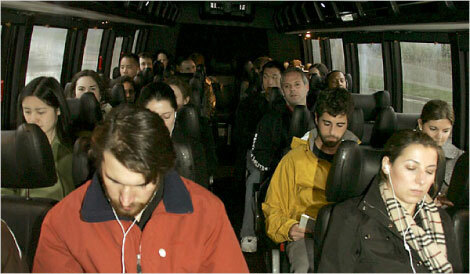 See also ride-sharing, by GoLoco, enabled via the web and social-software techniques. How route choice can be affected by real-time traffic information. This paper investigates route choice behaviour on freeways between Taipei and Taichung in Taiwan under the provision of real-time traffic information. This hints at the effects of analytical data fed back in real-time and displayed on-street. Based on London’s and Stockholm’s experience, many other cities are also now considering congestion charging. (New York State has recently voted against introducing it, indicating a classic state/city split, perhaps, amongst other things.) Again, though, the interesting aspect here is how such systems generate date about transport in the city or state. 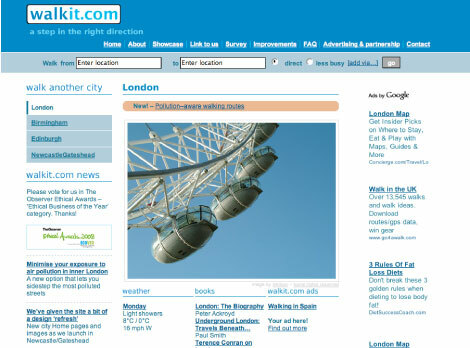 The technology behind London’s scheme has recently switched to IBM - there are no details thus far of plans for better feedback to users, or opening up the data and combining with other transit data, as in the idea above. See also the variable pricing congestion charging system proposed as an upgrade of Singapore’s Electronic Road Pricing (ERP). All these systems rely on sensors generating useful data, that could be multiplied with the public transport data from other systems. 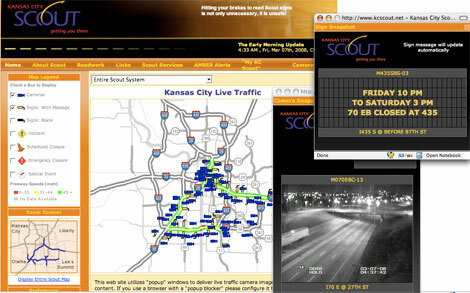 The Kansas City Scout offers visualisations of live traffic over their road networks, linked in to traffic cameras and signage displays. A new edition of the traffic detector handbook describes the various sensor technologies available. This emerging model is being trialled in a few stores now: the customer visits the store, tries on the clothes (or tries out other goods), and then orders them for immediate home delivery (you actually pay a premium if you want it immediately and carry them home yourself). 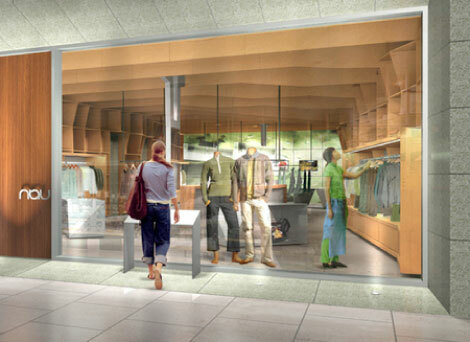 It’s effectively a “physical trial space for online shopping”, which plays on its sustainability credentials as well as convenience. 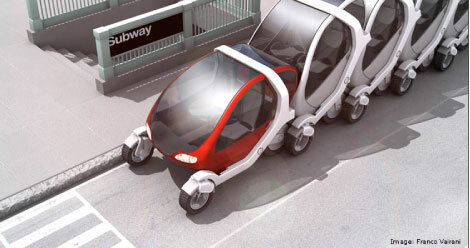 It enables shoppers to be downtown on foot, bike or public transport and not have to worry about the car. A reversal of the business model of Ikea and other big box retailers, pushing the urban downtown onto the front foot again. Supported by smart web-based delivery estimate systems (“Your package is 12 minutes away, on Birrell Street …”). Becoming known as the webfront retail model, these stores need only a small footprint, and therefore fit well into older shopping streets, laneways etc. Could this be something city governments could push, as a subtle way of increasing retail mix in urban centres and helping reduce individual car traffic in favour of more efficient home delivery models? See also NYT and the scooter project site at MIT. William Mitchell, leader of the Smart Cities group at MIT, suggests a slightly different model for the USA - with scooter rented for trips to destinations, and cars rented for journey back, so the scooters should be seen in the context of their wider CityCars programme. This is more ambitious but fascinating. 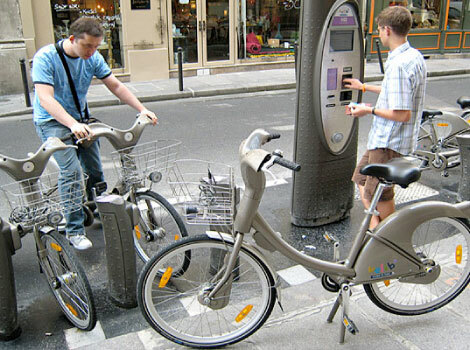 Velib’ in Paris, Vélo’v in Lyons, and Bicing in Barcelona have proved hugely successful (all cities with significant road systems, as well as dense urban cores). And Velib’ is now moving to London. His video available here. The patterns in the data tell the story of Barcelona on a sunny Sunday evening - the bikes moving from the beach, back to the city. These systems (when implemented holistically, with better bike lane access enabled alongside) have already been undeniably successful, creating a new engagement with the city. 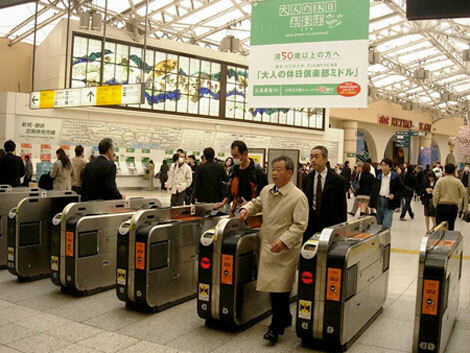 Data-based experiments such as these are also manifestations of this new level of engagement in public transport that the internet can engender. “We found out where the actual desire lines are,” said Freedman, and has since extended the network to enable users to rate streets for bikes. It’s a little rudimentary at the moment, but shows the promise of such systems. Boston are building the city’s first official bike map from the results of the system. Almeda County in California also runs wifi-enabled public buses now. Note the wifi is a free service. There are some fears this might increase sprawl but they seem a little misplaced. Either way, in cities that already sprawl it’s a way of making public transport more attractive through information (particularly as phones become wifi-enabled, as well as laptops.) This is something that private transport cannot compete with. MIT’s research project “Re-thinking the Paris bus line”, in conjunction with Paris RATP, provided a few prompts as to how to re-think buses and bus-stops in the context of urban informatics. Points 3 and 4 below are more do-able, initially. 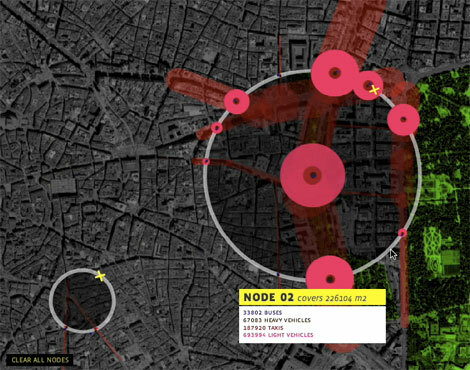 In the ubiquitously networked urban environment, the increasing possibility to control complex dynamic systems in real time with computers and to be seamlessly connected to portable devices allows us to design intelligently self-organizing bus routes. We can reconfigure the bus so that it can be structurally much more connected to the urban environment, to people and to city services. Moreover, by embedding electronic intelligence, sensors and communication systems in buses, we can escape the traditional bus design and explore innovative solutions that are more adapted to people's needs. We suggest new designs for bus stops that can take particular advantage of electronic displays and create a unique character for Paris, establishing new urban identities. Bus stops are not only entry points to buses, but also to local life in surrounding neighborhoods. 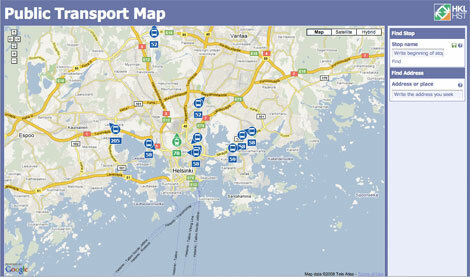 The earlier Helsinki example above is based on the transport authority’s open approach to data. These two examples from users, centred on France and Switzerland, use published timetables in a more predictive approach. See also Dublin’s trains, with data scraped from IrishRail and overlaid onto Google Maps. Stamen Design in San Francisco produced designs for SOM’s new TransBay Transit Center and Tower, embedding real-time transit information into the fabric of the building. By opening up data, external designers can produce information design works of high quality. Of course, professional designers can be employed to embed such information into the fabric of buildings and places too. In this case, Stamen’s designs aim to create engagement with public transport and the city, while remaining useful above all, in much the same way that the Flinders Street Station clocks have become symbols for Melbourne. Again, this indicates a form of informational work possible with public transport that really doesn’t have a parallel with private transport. The latest Very High Speed Trains (VHST) such as the Spanish AVE, provide wifi on the train. They aim to sell this to business travellers initially, but then make more widely accessible. Wifi is far easier to implement in trains than aircraft. 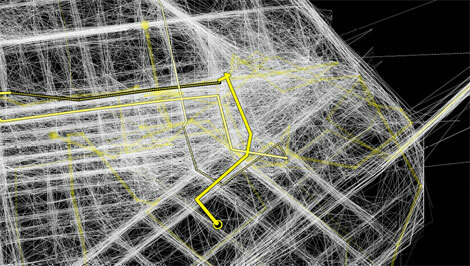 As with the information design above, Stamen have also placed GPS locators in cabs in San Francisco, to produce the CabSpotting project, which provides new layers of analysis into cab movements in the city. While this appears to be more of an artwork/R&D piece than a useful real-time public service, it too indicates the creative potential in this data. If this were extended to extrapolate transport energy data, how could this be conveyed to the public? 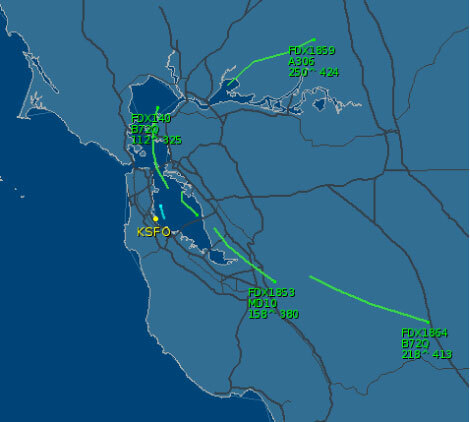 As above, external flight tracking systems are now common e.g. 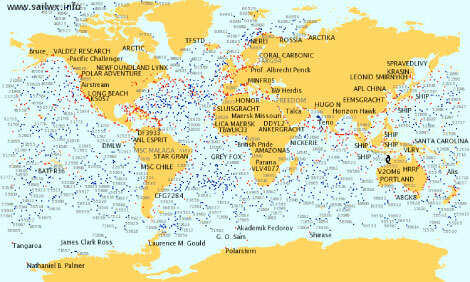 Flight Aware and fboweb.com. And as above, but with ships - Sailwx. How to encourage this, make visible, and extend to map transport energy (would be interesting in context of food miles)? Walkit provides a platform for user-generated walking routes in London, Birmingham, Edinburgh and Newcastle/Gateshead, including a set of new air pollution-aware walking routes, in conjunction with the City of London, UK’s environment agency and several inner-London boroughs. Londoners are used to walking - as with many European urban dwellers - but it’s generally less common in many ‘New World’ cities in USA and Australia. There it could use a little help from services like Walkit. "Check out the map above - through several parks and ... with no regard for one-way streets" says one US-based site, breathlessly. 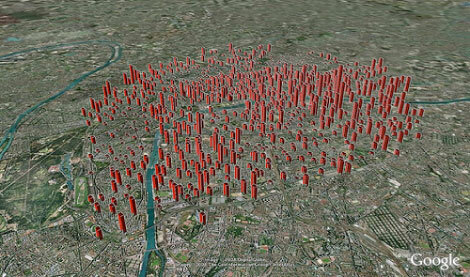 "It even calculates calories and CO2 saved based on walking speed and compared to other means of transportation. You can even choose low pollution routes that avoid ambling near heavy traffic"
Finally, the following images are from two great posts at Pruned about piezo arrays and crowd farms. 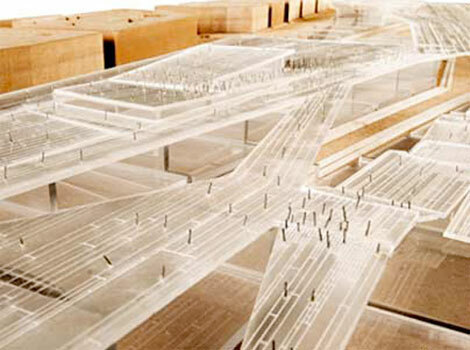 They discuss how pedestrian movement through spaces can generate small amounts of electricity via piezo arrays. They could also generate vast amounts of data about movement through a space, whilst usefully powering itself.